The technology behind dental implants has been around for about 40 years. But only in the last 15 to 20 years have dental implants become popular and accepted by both dentists and patients close to Myers Park and everywhere. Today dental implants are considered the best way to replace missing teeth. 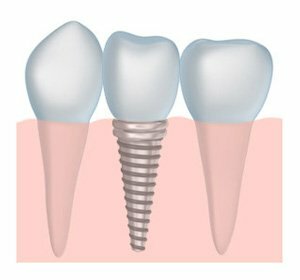 A tooth implant is a tiny screw made of biocompatible titanium. The tooth implant screw is inserted into the jawbone by an implant dentistry oral surgeon. As it heals, it integrates into the bone. Then, an implant dentistry dentist qualified in implant restorations places a small post or abutment into the screw. The tooth implant and post hold the final restoration –- a tooth crown, a dental bridge, or a denture -– solidly. A tooth implant can be a substitute for a single missing tooth, or multiple dental implants can replace all teeth in the upper or lower arch. The tooth implant stays in the mouth; it is not removed like a partial or denture. As a stand-alone restoration, it differs from a bridge in that dental implants do not require drilling on the adjacent teeth. Dental implants are maintained with only your good, regular dental hygiene. Another important advantage to implant dentistry is that, when placed into the bone, dental implants prevent bone absorption –- they help your body retain existing jawbone and prevent further bone loss. This helps you look younger by avoiding a sunken look. A durable tooth implant is ‘just around the corner’ for patients in Charlotte or surrounding areas. Implant dentistry dentist Dr. Chris Bowman has trained at numerous teaching and postgraduate cosmetic and restorative institutions. He is quite skilled and experienced in implant dentistry restorations. Dr. Bowman believes the best option for a patient who has lost all their teeth or needs to have them extracted is hybrid restoration. A hybrid uses multiple dental implants to hold one fixed restoration. It stays in place; only removed by the dentist for cleanings. This implant dentistry option is aesthetic and the desired outcome is achieved in just a few appointments. Since it is maintained over time with little expense, a hybrid restoration is a good investment for realistic result. Your self-esteem and your diet don’t have to suffer from a missing tooth. Call Dr. Bowman today or message us using the contact form on this page to find out how a tooth implant can give you back your smile! We provide patients with dental implants all across the Charlotte and Myers Park areas. You may have already heard of the Receding Gum Treatment on "The Doctors" TV Show, which refers to the procedure as the “Lunchtime Gumlift”. The TV spot emphasizes the incredible ability of this new technique we offer to resolve receding gum issues faster and safer than traditional methods. 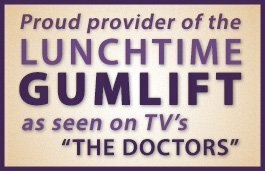 Yes, the Lunchtime Gumlift treatment is as good as TV makes it out to be!